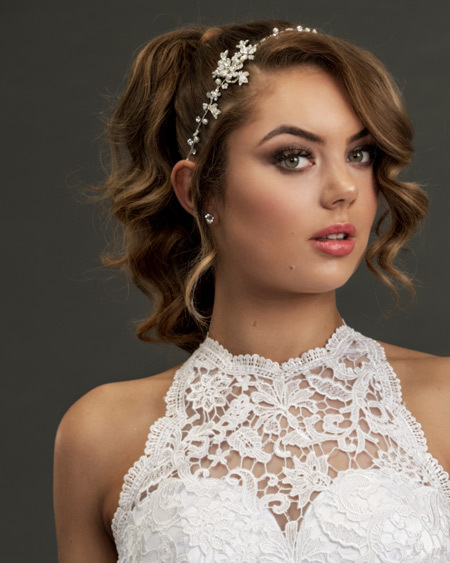 Our Megan halter-neck wedding dress was inspired Megan Markle’s look worn to her royal wedding reception. Who can forget the wonderful moment when the new Duke and Duchess of Sussex arrived at Frogmore Hall for evening festivities in a convertible electric Jag? As the Duchess of Sussex emerged from the car, she looked effortlessly chic, pulled together and incredibly happy! and so will you. 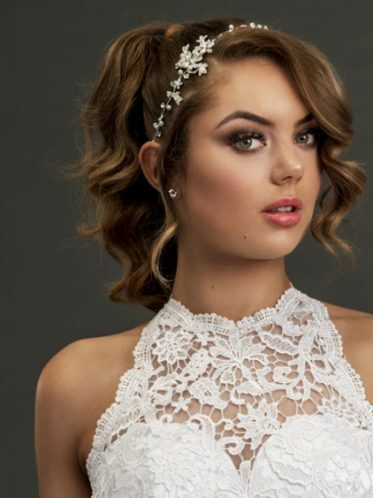 You might not be having a royal wedding, but every wedding is a momentous occasion that deserves the right look. 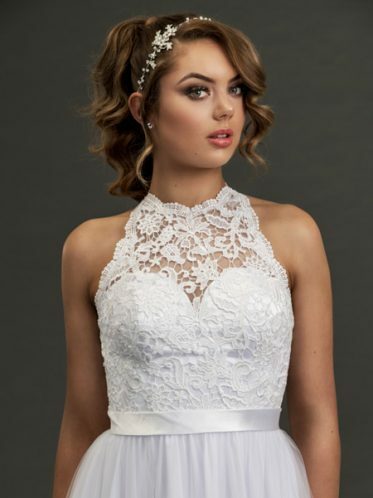 The Megan wedding dress could be just the right look for you with its lace halter neck and low keyhole back covered with beautifully designed white lace. The trainless tulle skirt with chiffon underlay creates a perfect balance to the superbly cut top. This dress is clean, fresh, classic yet modern. 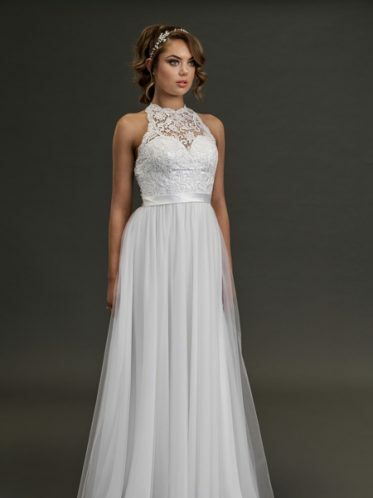 It is for a bride or even deb who has a strong sense of style this dress can match. It’s a dress for someone confident and lucky enough to marry a prince. The Megan demands a high heel with a difference and our Felicity shoes with their block heel, ankle strap and crystal adornments are perfect. Above the neck, brides can choose a simple or more complicated earring to complete their look. We offer our round diamante stud earrings or chandelier Hollywood earrings. We have matched our double hair vine for your photo shoot and a pair of simple stud earrings. All jewellery is from our Hallam super store. Possibly add a veil to give a more traditional bridal look. To look as good as a future princess, let us alter your wedding dress so it is a perfect fit. 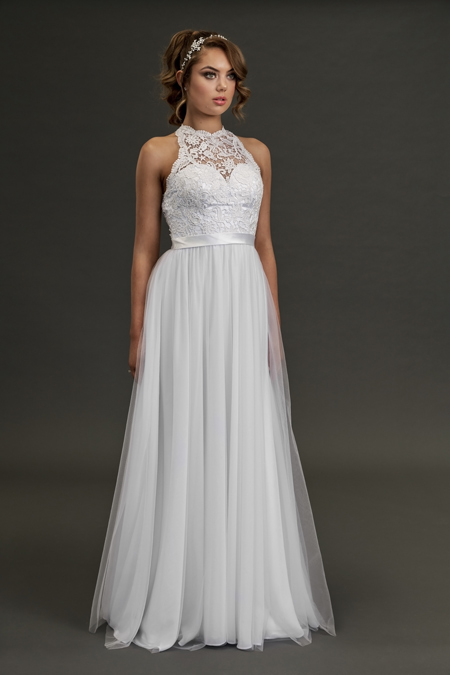 We offer in store alterations on all of our dresses.